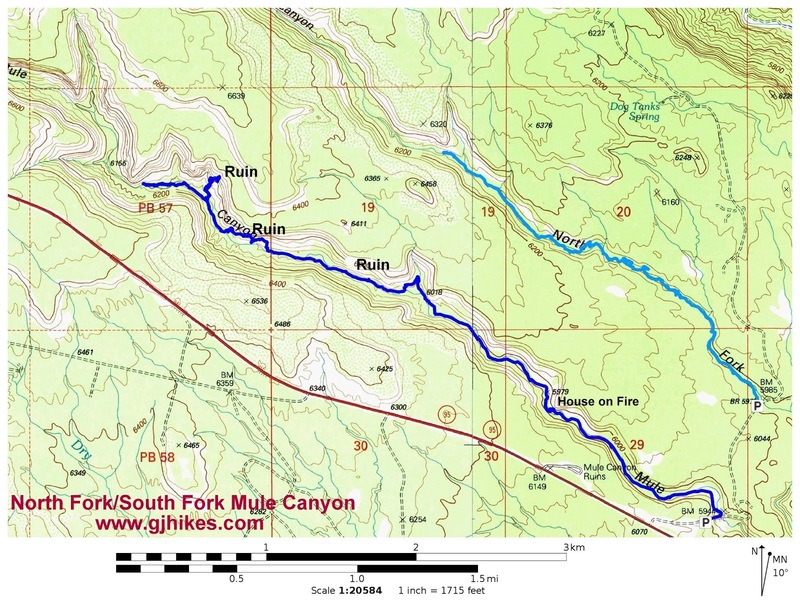 The House on Fire ruin is located in the South Fork of Mule Canyon near Blanding, Utah. The small cliff dwelling gets its name from the effects that the sunlight has on the sandstone cliff of the alcove that it is nestled in. The dark patina covering the overhanging sandstone lights up like flames lapping away at the cliff. With its close proximity to a paved road the House on Fire ruin attracts many eager visitors that are able to discover the location of the trailhead. The trailhead is about 23 miles from Blanding, Utah off of Highway 95, the road that leads to Natural Bridges National Monument. The turnoff is to the right at about mile marker 102. If you get to the Mule Canyon Ruins then you have gone too far. The trailhead is about a quarter mile down the dirt County Road 263. It lacks a parking area so get over to the side the best you can and park. Look for the trail that drops down into the wash on the north side of the road where you will see a BLM information kiosk. 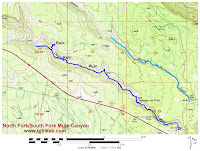 From there the easy to follow trail heads up the south fork of Mule Canyon. You will find that the trail crosses the wash and follows routes on higher ground for most of the first half mile. The wash itself is easy enough to hike in for most of the distance if it is dry. There are supposed to be 7 or 8 ruins in this branch of Mule Canyon with the House on Fire being the first one that you come to. The House on Fire ruin is almost exactly 1 mile from the county road where the trail begins. A little slickrock scrambling is required to get up to where you will want to take pictures. The fire doesn't get lit until the sun passes over above the cliff causing more light to scatter through the shaded alcove. Depending upon the time of the year it can be anywhere from about 0930 and high noon. On this trip we spent about 2 hours hiking around the area waiting on the event before our tight schedule required our departure. In the pleasant surroundings of the canyon the trail is an easy hike. If you continue up the canyon the hiking remains a cinch until you start trying to climb up to some of the ruins that are higher up in the rim. In our opinion the House on Fire site is well worth the visit even if it isn't being torched while you are there. As you know it is almost impossible to predict the weather or keep clouds from getting in the way so like us it may take more than one visit to get the perfect photo. We actually run into that problem on every hike we take. Some of which we have done 3-4 times and still don't feel we have pictures that we are really pleased with. If you would like to see it for yourself then all you have to do is 'Take a hike'.